This is the post we have been most excited to share with you. Ever. We didn't want to just share the images on their own and thought instead we'd give you an insight in to the preparation, tips and items / brands / websites we used in the hope that another bride and groom to be would happen across this page and be able to take inspiration or direct contact with something that would ease and complete thier big day. We started preparing for the wedding last year (2016) and we did this by looking for our venue, we figured once we had that sorted, we could start to build the other details around it. The only thing we knew at this point was that we wanted the wedding in Portugal. We wanted the weather and we wanted to be outdoors. 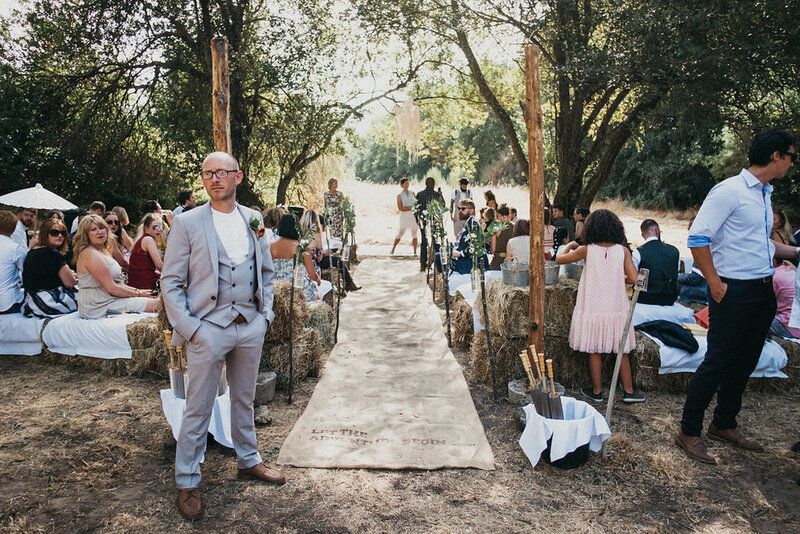 With this in mind we set out to look for a campsite or venue that could give us a relaxed, festival vibe where we could get married under the sunshine and dance into the evenings warm breeze. By chance in March 2016 we stumbled across a venue called 'Senses Camping' it was a camping site nestled in the northern Portuguese mountains and when I showed Carlos and he looked at the address, we realised it was part of the same mountain he grew up on, just round the other side! Right there and then, without having visited the site, we stopped our search for venues and booked a trip to visit Senses, but we had our gut feeling that this was the one. When we took the trip in June that year, it was only after a few footsteps onto the site that we knew our feelings were confirmed. The smell, the view, the peacefulness, the space, the people, the animals and the feeling, everything was right! You can check out the post after we first came back from finding the venue HERE. Over the course of the next 12 and a bit months we started to organise what our big day (or as it turned out to be, weekend) would look like. We first agreed on a colour theme and feel to the wedding and both agreed on a grey, white and copper wedding with lots of leafy green and wild floral. We aren't people who wear or enjoy lots of colour (and this doesn't make us miserable people!) so we stuck with muted tones that complimented us and the surroundings. We also wanted to create a vintage, bohemian vibe using the campsite like a festival ground, having different things happening in different areas, making sure we used the full land to the best we could. We left these and a welcome magazine in everyones tent for when they arrived! They contained water, rehydration salts, chewing gum, bobbles, hair grips, Vitamin C drink, painkillers and plasters! As we mentioned in the last post, we tried to keep our supplier chain to a minimum and so for decorations we were on the look out to get as much as we could from one place while then trying to utilise items we had at home and collect vintage copper items to use to hold flowers. While looking through Pinterest (a bride to be's best friend!) we discovered some images which linked back to a website called Luna Bazaar, The website was a dream holding bohemian, vintage and lots of Asian inspired decorations which ticked every box we could of hoped for. We created a list of items we wanted picking every item we liked, adding them all to the basket as we went. At the end we went back through and really thought about each item we liked, where it would go, if we needed it and how many we needed. We managed to get blankets, candle holders, table runners, parasols, fans, lighting and a lot more from them. Keep an eye out below for the items listed but fall in love with their styling on their IG page! Other decoration items we had included a macrame backdrop for behind our top table seats, plant hangers and a chandelier for above where we would get married. Again keeping it all in theme but drawing different areas together with linked in items. These were the perfect bohemian touch and we found the most perfect lady to make them for us. We couldn't recommend Louise at Macramé Adventures enough. She started her business after creating a backdrop for her own wedding and now has her own etsy store selling so many amazing creations (make sure you follow her Instagram to get the most of what she does!). We gave Lou an idea of what we wanted but left the design to her and as you will see in the images, she gave us more than we could of ever hoped for. She completely nailed it on the head with our style and her design. As part of our favours, we got everyone a copper Moscow mule to drink with and take home. We got these from Rinkit. For our outfits, we knew a formal typical wedding style was really not us. We wanted to embrace lots of the wedding traditions but do it with our own twist. We wanted to make sure that everything we purchased for us to wear was something we could re-use again so we decided to get items from brands we already wore and loved and the same with the rest of the wedding party! For my wedding dress, it was probably the first thing I started looked for after getting engaged, I started following boutiques, designers and wedding based IG accounts to keep my eye out for a style I liked. I knew I wanted something 70's rock / bohemian inspired and I found lots that I liked but none were jumping out at me. I'd perhaps like one or two from a collection but nothing more and wedding dress shops were so spread out, it wasn't like you could go to a road in London and try them all on (at least not for the brands I liked as most were LA or Australian!) but, then I discovered Rue De Seine Bridal and I knew instantly it was the one! I looked through the collection and just loved them all both new and old. They had a trunk show coming up later that year at Leonie Claire Bridal Boutique in Brighton and I jumped at the chance to grab an appointment. On the date of the trunk show i turned up and was greeted by the lovely Leonie who showed me through the full Rue De Seine collection as well as some older collection pieces, I made my selection and we were taken down stairs with a glass of bubbly to begin the trying on! I made my way through around 15 dresses fairly quickly, instantly knowing if it was one I felt comfortable in or not and I took it down to 3 dresses. I went to try those 3 on again but I tried one on, decided it wasn't the one and went straight back to and decided on the Morrison Dress, I didn't even go back to the third i'd saved as I knew it would never compare to the Morrison now. Finding the dress for your big day is such a special feeling! Having my friends and mum there and being in such a comfortable surrounding and looked after so well made the day even more special and one I wont forget! The boutique even had white, grey and copper as their colours! What a sign?!? I originally loved the thought of having a dress change at the event but after falling so in love with my dress, I knew I wouldn't want to take it off! Instead I settled on a headpiece change and had three different ones through the day! Keep an eye out in the images below for notes on all my other items worn! All my bridesmaid outfits were custom made from Motel. I've been at the company for 10 years this year and having outfits made by them made it really lovely to have it as part of the day. The girls each choose a shape top they liked and we used the copper sequin from the AW16 collection. I then found a maxi wrap skirt which I loved and the girls all happened to love as well and I had this made in a dark grey silk fabric. I love the idea that the girls could each wear items from their outfit outside of the wedding. For Carlos, he decided he wasn't going to find a suit in the shops that he would want to wear instead, he knew he had to work with someone to design something unique and his style. Then he was introduced to the tailor VSMONO and set to work with him on creating his own personalised suit. I wanted pinstripe and decided to do it in a light grey to go with the wedding colours and had it it made all in linen to help cope with the temperatures! Together with a combination of my ideas and his, he started to sketch the concept, style and detail until we got it down as a style we were both happy with. John, the owner of VSMONO, then gave me two more appointment dates and started work on turning our drawing into a reality! I was called in to try my wedding outfit a few times to check fit, shape and length. The whole process was amazing and John and his team were extremely accommodating it was great to see the suit come to life over the appointments. I actually picked up my suit fairly early on in the year before the wedding which gave me time to find the right shoes to go with my look. I settled on a pair of Trickers (one of my favourite shoe brands out there). I went with a medium brown, suede pair of double buckle monk straps called Rufus. I also wore my wedding gift that i received that morning from my beautiful bride of a silver collar chain from Acid Mountain. And now all thats left to do is share the rest of our images with you from our big day. We had such a crazy emotional, stressful ride before and at the wedding but we wouldn't change a thing. We got to spend up to a week with some of our nearest and dearest and have everyone we love under the same roof. Theres no greater feeling than just being surrounded by everyone who made a difference in your life and than you wish you could always be with. Theres really not many (if any other) chances in your life when that will happen again so we advise everyone to embrace it, enjoy it and be in every moment as much as you can. Everyone says it, but its gone so quickly and you won't want to look back and feel like you missed something. This day is a seriously special day marked in our timeline and we hope you enjoy it too. Now can anyone give us the cure for serious after wedding blues?!? We could not have asked for a better celebrant than Carly. She was fluent in English and Portuguese and worked with us on a bespoke multilingual service to keep everyone involved. She was so sweet and made the service magical!